I simply loved the idea, because for people like me who cannot actively contribute to the festivity of this Memorable day, what is better than to cook a thing as special as the day itself? 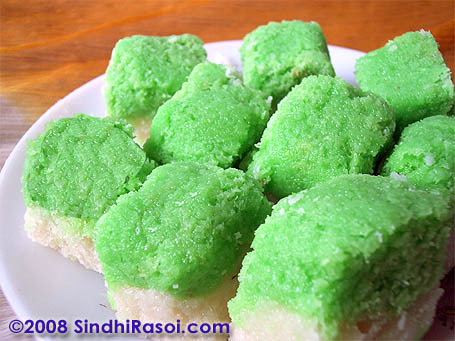 So here I come with a Typical Sindhi Mithai, made with dessicated coconuts.I know there is still a week to go for the D Day, but considering the pathetic situation of non availability of Electricity for almost 8 hrs everyday and Internet connections going Kaput every now and then, hence I didn’t wanted to wait till next week.Despite of all the jabbering against the place I live, Istill love my India.So wishing you all a very patriotic Independence day ! Now divide this syrup into two halves, add little amount of green colour in one half and leave the other half as it is. Hi Alka. 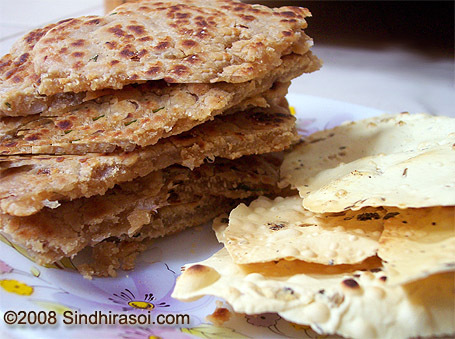 Thanks for the mouth-watering sindhi recipe. I plan to make this today but just wanted to know if I can use fresh grated coconut instead of dessicated coconut? Thanks! I will post again how the mithai turned out. take a milk maid can and nariyal chura. mix it as requried and ENJOY! simple! btw, very sorry to hear about you mom. may she rip. Hi, I have visited your blog after a gap and your blog looks great! I believe this is as beautiful as it gets. Do keep up the good work. However do give a recipe for bhugal maao and maajoon. Looks great Alka, love the colors. you made sweet yeah. Congrats on being nominated the presentation is really good.